We’re excited to team up with the Good Food & Wine Show for the fifth year running! Gather all your foodie friends and embark on a culinary weekend adventure at the Perth Convention and Exhibition Centre from 24 – 26 August. Whether you’re interested in the wine or the dine, there are options for every palate. Cheese, wine, and celebrity chefs! Start planning now because you won’t want to miss all the incredible exhibition booths and culinary demonstrations at this year’s show. Sample produce and gourmet products from all your favourite local icons, or try something new from the range of international exhibitors. Learn from some of the best Australian chefs on the scene as they prepare their signature dishes live on the Princess Cruises Theatre stage. Matt Moran, Colin Fassnidge, Hayden Quinn and Miguel Maestre will be cooking up a storm this year, and demonstrations are included in the price of your ticket. Still hungry for more? Check out some of the additional sessions and classes offered each day. Become a master wine taster at the Riedel Drinks Lab, go on a “cheese appreciation journey” with the experts at The Smelly Cheese Project or try your hand at mixology with the After Hours Cocktail Workshop. No matter how you choose to spend your time, be sure to arrive with an empty stomach. See how local flavours can shine at this year’s Kleenheat Kitchen – a free event across all three days – as home-grown chefs show off their skills in the kitchen. 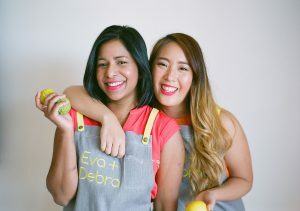 The dynamic duo from 2015 My Kitchen Rules, Eva and Deb, will again put the spotlight on Asian cuisine andshowcase their heritage through mouth-watering dishes. They’ll be joined by WA’s own Josh Catalano from Fish Boss and Guy Jeffreys, Head Chef at Millbrook Winery, who’ll show you how to bring local produce alive with flavour. The Kleenheat Kitchen will again enjoy quality goods from Harvey Beef and Mount Barker Chicken, highlighting some of the best produce WA has to offer. Visit the Kleenheat Kitchen throughout the day for demonstrations and more! 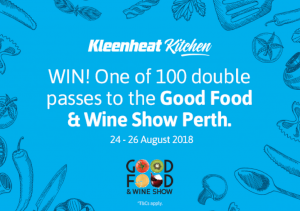 To celebrate Kleenheat’s ongoing support of Perth’s Good Food & Wine Show, we’re giving Kleenheat customers the chance to win one of 100 double passes to this year’s show! You and your plus one will enjoy free entry to one of four sessions. Check out all the amazing events on each day at the Good Food & Wine Show website. Entries close at 5:00pm on Friday 29 June. Exclusive offer for Kleenheat customers! Being a Kleenheat customer is all about enjoying better value. That’s why we’re excited to announce our exclusive Good Food & Show offer just for you! Kleenheat customers can catch all the action for less with our special 2-for-1 ticket offer. We’ll be revealing details on how to redeem your 2-for-1 tickets in our July customer newsletter so keep your eyes peeled for this amazing deal. We love food and wine, particularly WA produce. Cooking with gas – you cant beat it! Gas is so controllable, the best for everything.